“My care here is great. My room is kept nice and I have an amazing roommate. Although I would love to be home, if I have to be anywhere other than home, it is here at The Grand Pavilion!” – Florence E.
“The Nurses here at The Grand Pavilion are great, trustworthy, and provide excellent care.” – Denver H.
“Working in The Grand Pavilion is a great learning experience. I have the privilege of interacting with so many different types of people. Everyone here is so kind and nice”- Jonathan D.
“The staff at The Grand Pavilion is wonderful! Everybody is very careful with the care of my husband, Fred. Everyone is very professional. I am very happy that we chose this place for rehab.” – Hilde H.
“I find that in this community the staff are very responsive to their patients, and the PT and OT staff are fantastic.” – Gail B. “I have been cared for very well by the nurses, the aides and my physical therapist has been very thorough and exceptional.” – Rodger N.
“Loraine and Daisy are caring, professional employees who have gone beyond my expectations. I am so glad they are there to care for my mother & the others at the Grand Pavilion.” – Jane H.
“My physical and occupational therapists are phenomenal as well as the rest of the crew here. I have come a long way since I got here, and I am looking to go home very soon.” – Elijah C.
“Come to The Grand Pavilion, a place where healing and care is the priority not an option.” – Luis A. “My husband and I are 96 years old and 90 years old, respectfully, and within our lifetime we have been to many rehab centers. This is the only one that I have ever wanted and looked forward to coming back again. This is the second time coming to The Grand Pavilion for me, and the third time for my husband, so that in itself tells you how satisfied we are with The Grand Pavilion. Mark, the Director of Concierge Services, has been wonderful. Whenever I have had a matter that needed assistance or solved, I always knew I had Mark on my side to get it solved!” – Anita U. “I am having a very happy stay here and the nurses have been very kind. There is a very nice young man by the name of Mark (Director of Concierge Services) that comes in to visit me even though he doesn’t have to, and he has a lovely little baby boy!”- Margaret R.
“I have to tell you, Mark, the Urban Zen essential oils and relaxation really works! Any time I am nauseous I smell the oils and it really helps.” – Laura P.
“Living here has been a pleasure. The staff are always accommodating and provide assistance when I need it. My therapy team I work with every week has encouraged me to put my best foot forward and not get discouraged so easily. I’m making great progress and I’m glad I selected this place to help me with my growth.” – Mary B. “At The Grand Pavilion, people are something to [rave] about. When I have something I need, someone is there, and it’s not always my nurse. If I hit the call bell and someone is walking by, no matter who it is, they make sure to ask me if I need something. If they can’t help, they’ll find someone who can, and to me, that shows how dedicated each staff member is.” – Renee B. “The rehab is phenomenal. I was able to get back on my feet again and was able to return to the assisted living I was once at. The staff is so nice and determined to get their patients better and it shows every day.” – Catherine M.
“Staying at The Grand Pavilion for as long as I have has been an amazing experience. I started here as a short term patient and am converting to long term shortly. I don’t mind staying here; it’s a place you want to be. The people are caring and you feel it. The rehab is great and they always offer something to keep you busy.” – Lila S.
“The recreation team is awesome; they always play great movies and keep me entertained, there’s never nothing to do.” – Glenn Y. “The nurses here are always available to help me when I’m in need. My therapists really push me to strive for growth and send me back to the same if not better level of functioning; the environment as a whole is upbeat and makes you want to succeed.” – Robert B. “Everyone is so attentive, friendly, and genuine.” – Rose D.
“My first thoughts of coming to a rehabilitation center were not positive, however, now that I’m here I’m happy with my decision. 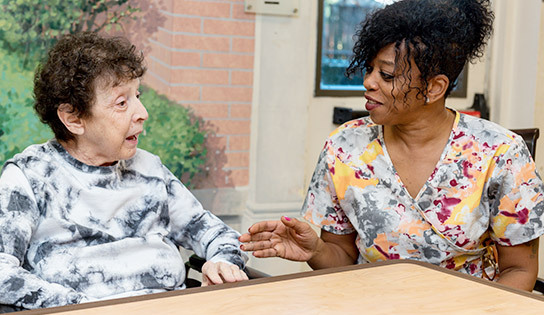 The staff are hard working individuals who you can tell are passionate about their work.” – Catherine M.
“I’ve been to other nursing homes and your place beats them all. Some of the staff I would adopt as my own and they have cared for me in a way I will always remember.” – Joel S.
“Everyone is so friendly and upbeat. If I have any sort of problem, as soon as I make my needs known it’s taken care of.” – Louise S.
“I love participating in the recreation therapy that they offer. From karaoke, to art therapy, to great movies and my favorite, a great game of chess, it really just brightens my day.” – Nick P.
“From when I stepped in the building and met with Courtney and Tammy, to the nurses on my unit and the great therapy that’s provided, the team is wonderful. You can tell when people are compassionate about their work and that they care.” – Robert B. “At first I didn’t want to be away from my wife and the life I knew, but after being here for a short time it’s not too bad and the staff is always friendly.” -Steven H.
“The nurses and staff here are always attentive and cater to my needs. When I first arrived, I was in a lot of pain and didn’t enjoy being here. After the pain subsided and I was comfortable, I realized it was a happy place for me to get better with people that also are here to get better. I’m happy I chose this place over any other.” – Thomas R.
“I’ve been here once before, and the renovations are beautiful. The staff have always been loving and so nurturing.” -Linda V.
“The staff and other patients at The Grand Pavilion are my family. I’ve made so many new friends while being here and I look forward to getting up and starting my day with such great people. The physical therapy team has done wonders and I see myself progressing.” – Wilhelmenia A. “The Grand Pavilion was a blessing for me. I was very sick when I came from the hospital and they pushed me to get better. I would tell anyone to go there.” – Patricia O. “Lately, my life has been full of darkness; the staff at The Grand Pavilion has been the light and has given me hope to get well again.” – Joel S.
“It’s a beautiful place with beautiful people, thanks for all that you do.” – Nina A. “All the employees at The Grand Pavilion are professional, friendly, and caring. I enjoyed my stay here and am looking forward to heading home and getting back to my old routine.” – Ronald L.
“The Grand Pavilion has helped me in so many ways. All the staff are all such special angels, especially the nurses and physical therapists who are very knowledgeable and always helpful.” – Shelby H.
“The Grand Pavilion is a clean, therapeutic environment and operates a well trained facility for skilled nursing and rehabilitation. We had an excellent experience and I’m very happy.” -Lila S.
“I love the staff on the first floor, they are always so wonderful and comforting when my anxiety acts up. The music programs that Jodi has are always a blast to attend as well.” – Pearl L.
“The staff were very pleasant. The atmosphere was comforting and I haven’t had any problems.” – Linda L.
“Being a new resident, I was skeptical of being in a nursing home; however, over the course of my stay, the staff and other patients have been nothing but concerned about me and that makes me happy.” – Edward B. “I have no complaints, the staffs are all so nice and I was comfortable throughout my whole stay.” – Alicia H.
“I’ve never been to a facility where all the staff makes their residents happy; it warms my heart.” – Ethelyn W.
“The Grand Pavilion is a clean, luxurious place with good workers.”- Barbara T.
“I don’t have a favorite employee who has made me feel comfortable, they all do.”- Rubin G.
“The staff is very nice, and they are always helping me with things I need help with.” – Leonor, V.
“I like living here, it’s very homey and I love the colors, too.” Anna D.
“I enjoy the people that work here, and how much everyone cares for me.”- Patrick G.
“I like all the people here, you helped me when I was very nervous about the rehab. You also came and visited me to make sure I was doing well the entire time so far.” – Josephine L.
“The staff at The Grand Pavilion are always willing to answer any questions I may have and are very sweet, especially the people who care for me. My favorite thing about living here is that they always keep me busy and there is plenty to do.” – Viola N.
“The Grand Pavilion is a very nice place to be. The staff and other patients are friendly and recreation always plays good music; I love my music.” – Christina F.
“I really enjoy the solarium on the first floor. Yesterday was my birthday, my cake was delicious and all of my family came. It was a very nice way to celebrate my special day.” – Lewis, R.
“I enjoy living here. Everyone is really nice and always willing to help me if I need it. I don’t have any complaints.” –Xiques, M.
“I’ve been in another rehab once before, and I’m enjoying my stay more here than I did there. The staff is very nice and the food is surprisingly good. I would recommend coming here for rehab.”- Peterson, H.